Anemia is a low level of healthy red blood cells (RBCs). 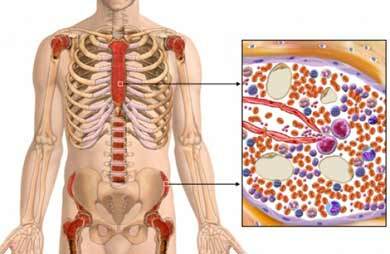 RBCs carry oxygen from the lungs to the rest of the body. When RBCs are low, the body does not get enough oxygen. Aplastic anemia is a type of anemia caused by problems with bone marrow. It is a rare condition. It can range from moderate to severe, and in some cases, it can be life-threatening. Aplastic anemia is believed to be caused by the person’s immune system attacking the bone marrow. It slows down the production of blood cells. In some cases, aplastic anemia is a temporary side effect of a medication. It can be reversed if exposure to the cause is stopped. The cause of aplastic anemia is sometimes unknown. After you are diagnosed with aplastic anemia, you may need additional tests to determine the cause. You will be referred to a blood disorder specialist, a hematologist, or a special treatment center for further evaluation. Talk with your doctor about the best treatment plan for you. Treatment for aplastic anemia varies according to severity and cause. Blood transfusions provide your body with the blood cells that your bone marrow has stopped producing. This is not a cure. It helps relieve symptoms. These medications change or slow your immune system to keep it from damaging your bone marrow cells. This gives your bone marrow time to recover and begin producing blood cells again. These medications are sometimes used along with steroids to reduce side effects. This treatment often requires a short stay in the hospital. The replacement of diseased bone marrow with healthy bone marrow is the best treatment option for some with severe aplastic anemia. You will need a donor whose bone marrow matches your own as closely as possible. Your aplastic anemia may be mild to moderate. It may also be caused by exposure to radiation, chemicals, or medications. Your doctor may choose to monitor your condition if the cause of the aplastic anemia is stopped. This approach can be enough to restore normal bone marrow function. Most cases of aplastic anemia cannot be prevented. Limiting exposure to certain environmental toxins can reduce your risk of developing the disease. Environmental toxins include those found in gasoline, paint, oil and coal emissions, and industrial solvents. Aplastic anemia. EBSCO DynaMed Plus website. Available at: http://www.dynamed.com/topics/dmp~AN~T114428/Aplastic-anemia. Updated December 20, 2016. Accessed September 29, 2017. Aplastic anemia. Merck Professional Version website. Available at: http://www.merckmanuals.com/professional/hematology-and-oncology/anemias-caused-by-deficient-erythropoiesis/aplastic-anemia. Updated November 2016. Accessed September 29, 2017. Explore aplastic anemia. National Heart, Lung, and Blood Institute website. Available at: https://www.nhlbi.nih.gov/health/health-topics/topics/aplastic. Updated August 22, 2012. Accessed September 29, 2017.